The Center for Operational Oceanographic Products and Services manages the National Water Level Observation Network (NWLON). NWLON provides basic water-level information to determine U.S. coastal marine boundaries and to create nautical charts. 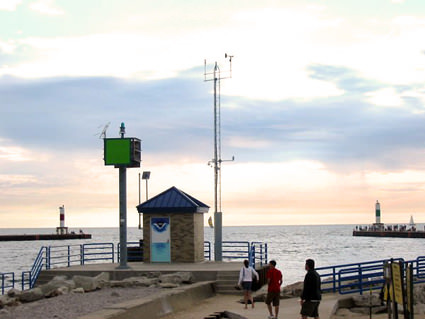 On September 9, 2011, a new water level station on Lake Michigan in Holland, Michigan, was declared officially operational. The new station, a replacement for an older structure, was a joint upgrade effort by NOAA and the U.S. Army Corps of Engineers, Detroit District office. The new station is expected to provide modernized and highly-reliable water level data to the Great Lakes community for the next 50+ years.